Dr. Helmut Wittek was born in 1973. At the age of 6 he joined the renowned Tölz Boys Choir, becoming a soprano soloist and later a singing teacher. After studies in musicology in Munich, he studied sound and video engineering at the Fachhochschule and the Robert-Schumann-Hochschule in Düsseldorf, receiving the Dipl.-Ing. degree in 1999. He joined the Institut für Rundfunktechnik (IRT) in Munich in 2000 as a research engineer and worked with Günther Theile on Wave Field Synthesis, Stereo and Surround recording techniques and binaural audio. Aside his official job he started a PhD at the University of Surrey (Dr Rumsey, Dr Theile) in 2002. In 2008 he was awarded a Ph.D. at the University of Surrey. Since 2005 he has been with SCHOEPS Mikrofone GmbH, Germany, as a Sales and Development engineer. 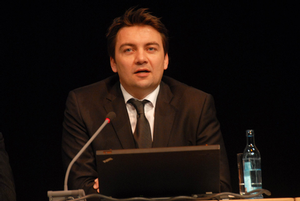 In 2007 he was appointed Head of Engineering and in 2009 he became co-CEO of SCHOEPS Mikrofone GmbH. Wittek is member of the VDT and the AES, and has written a number of papers for their international conventions. He frequently is giving lectures and practical seminars and he works as an associate professor for the Hochschule der Medien, Stuttgart. Furthermore, he is the host of the Website www.hauptmikrofon.de, a forum for stereophony and microphone technology.